A fully integrated vacuum-hoist lifter with manual tilting that is designed for handling compact metallic loads in pick-and-place assembly applications is being introduced by ANVER Corporation of Hudson, Massachusetts. The ANVER APU-Series Assembly Lifter is a hoist-based, vacuum powered unit that features a custom pick-up suction pad for lifting compact metallic loads and provides a manual tilt mechanism for pick-and-place applications. Suitable for assembly operations and feeding machining centers, this lifter- tilter eliminates metal-to-metal contact and the problem of magnetization. 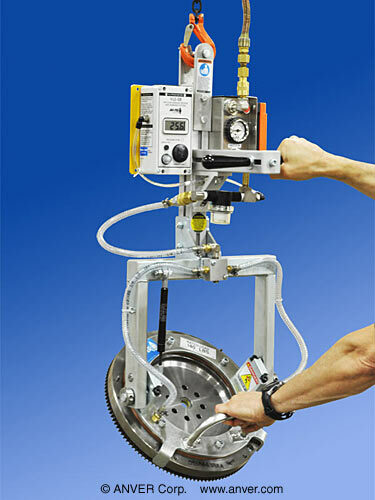 Allowing one person to safely handle small parts weighing up to 250 lbs., the ANVER APU-Series Assembly Lifter vacuum head uses compressed air and the venturi principle for securely holding the load while the electric chain hoist provides up/down movement to maintain position without drift when stopped. A VLS-8 vacuum loss sensor is standard for leak detection.